One Night Only! Come One, Come All to The Great Nickelodeon Show! Courtesy: The Marnan Collection LLC. 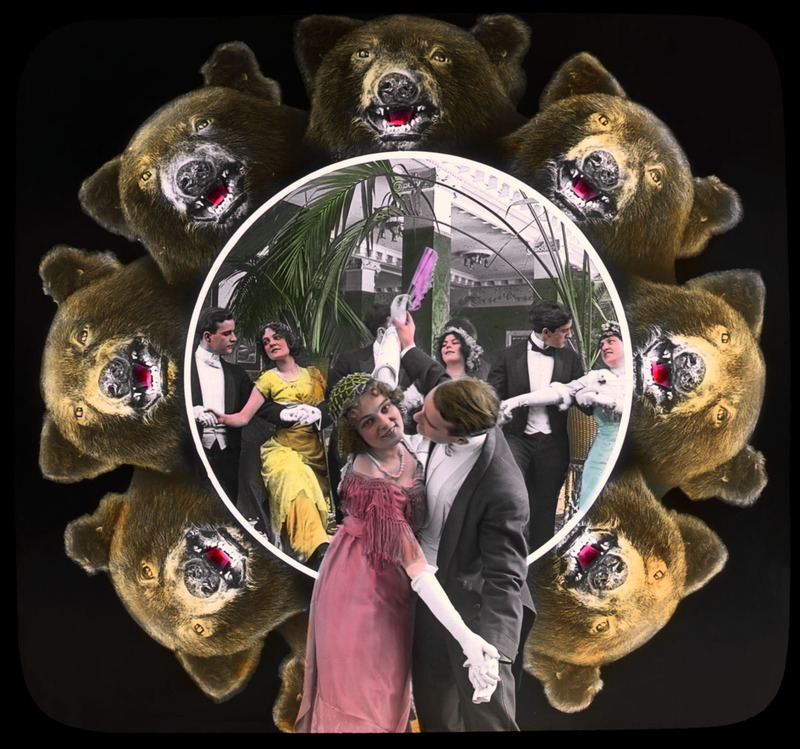 See all-new, hand-colored silent films accompanied by Master of the Silent Screen Piano, Frederick Hodges! 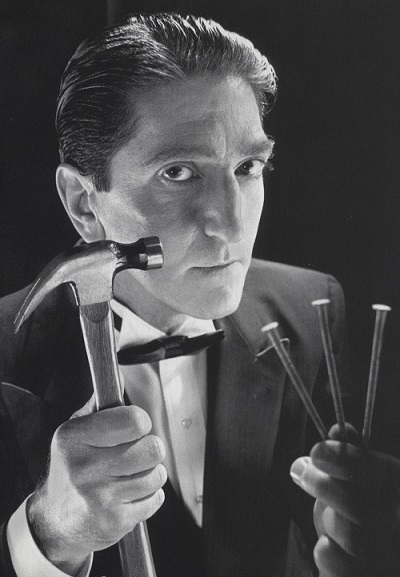 Thrill at illusionist extraordinaire, Reed Kirk Rahlmann, Master of Physical Wonders, still uncensored but all-new, rivaling Houdini and the Great Sandow for his outrages against the human body! 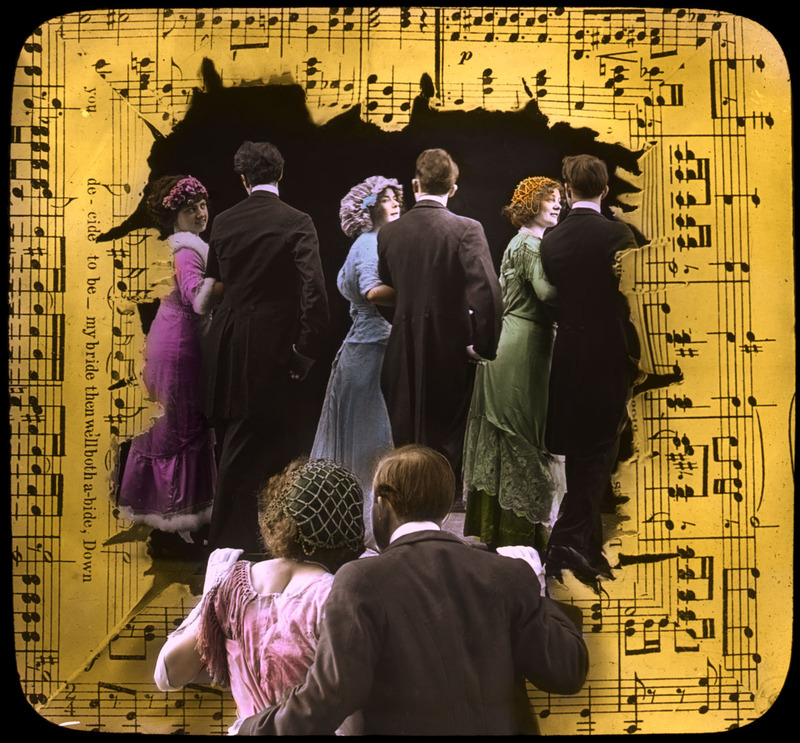 Marvel at Georges Méliès’ fantasy masterpiece The Kingdom of Fairies (1903), performed as San Francisco originally saw it—with narration—recreated by the San Francisco Thespian Ensemble. Watch screen rarities! 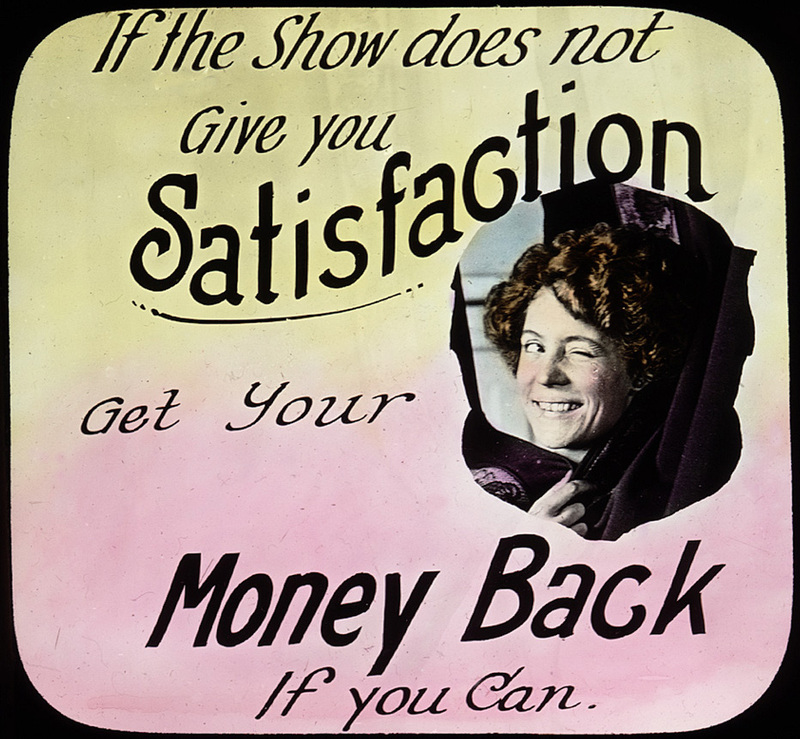 A D.W. Griffith thriller, trick films, and poignant drama—all in color! To put it another way, on Thursday, 26 March 2015 at 8 pm, the Vogue Theater will host a recreation of a classic nickelodeon program—a modern version of what it was like to go to the movies in 1910, when hand-colored films were sandwiched between live vaudeville acts, lavishly illustrated songs, and novelty lectures. This is a kind of multi-media entertainment that has vanished, and is hard to re-capture. The nickelodeon was as interactive as any video game and more variegated than any late night talk show. 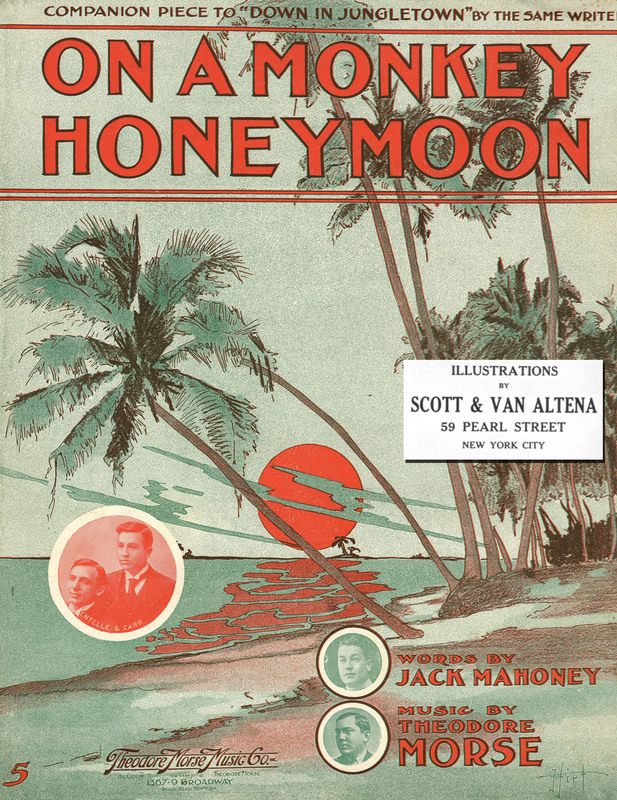 But, more important, it was where American fiction films got their start, and where for 10¢ or 15¢ (nickelodeons were seldom a nickel) you could watch movies, get the latest news, hear the latest songs, and, if you wanted, join in the chorus. The nickelodeon heyday was short. 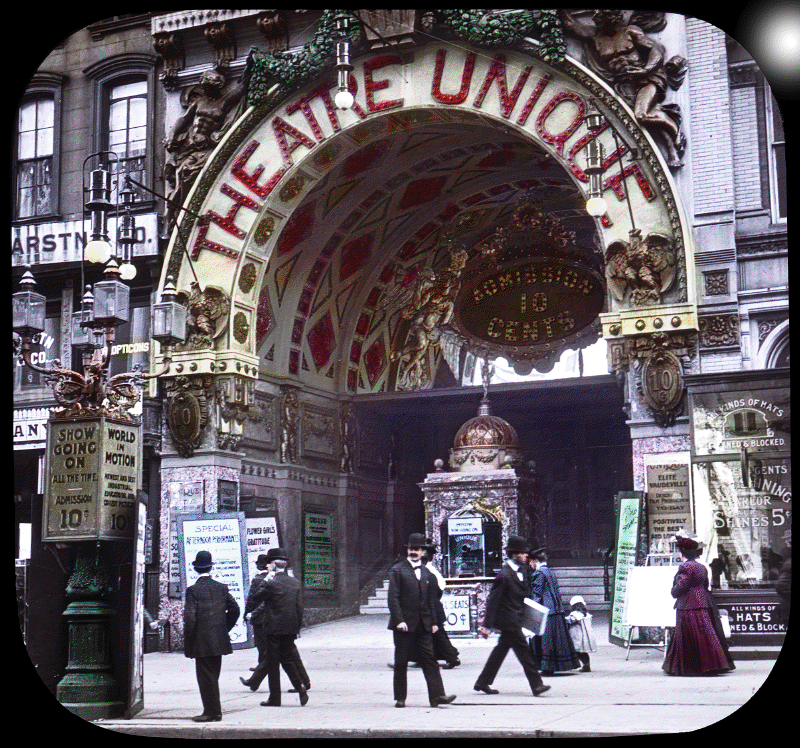 The first nickel theaters were built in 1904 and their golden age lasted only until the start of the First World War. But during that time they became a runaway sensation—a get-rich-quick scheme that became a national addiction. 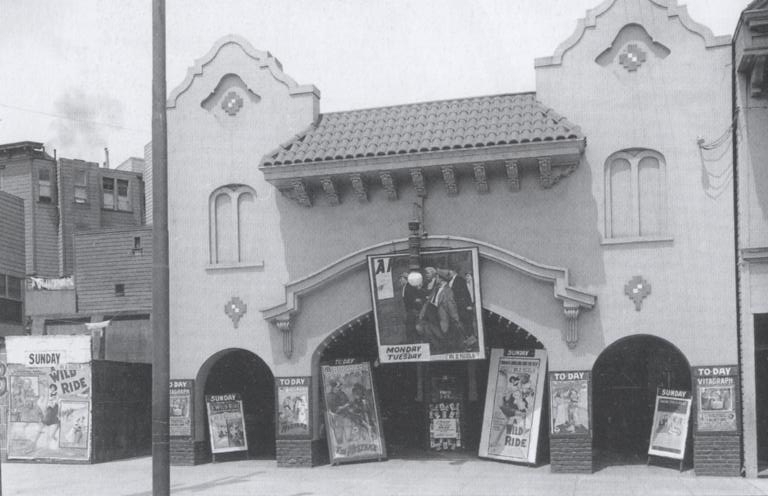 Here is where audiences discovered the first movie stars (notably Mary Pickford), westerns, foreign trick films, D.W. Griffith, and—above all—slapstick comedies. Mack Sennett got his start here, and through him, Charlie Chaplin. The Unique was of the first Nickelodeons in San Francisco built by David Grauman (Sid’s father) at Market between Mason and Taylor. This, however, is a Unique from Union Square in New York. No two nickelodeons were alike; they ranged from the elegant to the fleapit. Trade journals crusaded for high-class theaters, encouraging managers to accompany movies with themes from classical and semi-classical music. But many of the pianists were recruited from dance halls and brothels, left to improvise the music they knew best. In San Francisco, the Barbary Coast provided a rich supply of honky-tonk and ragtime musicians looking for part-time work. What movies to show, what live acts to put in between, and how to arrange them all were decisions left to the individual theater owners—who generally improvised like mad. The only rule was to entertain the audience with as much variety as possible and cram into the tiny auditorium the maximum number of shows. When our Vogue Theater started life as The Elite, it sported about 400 seats; today it stays within the nickelodeon average with 220. 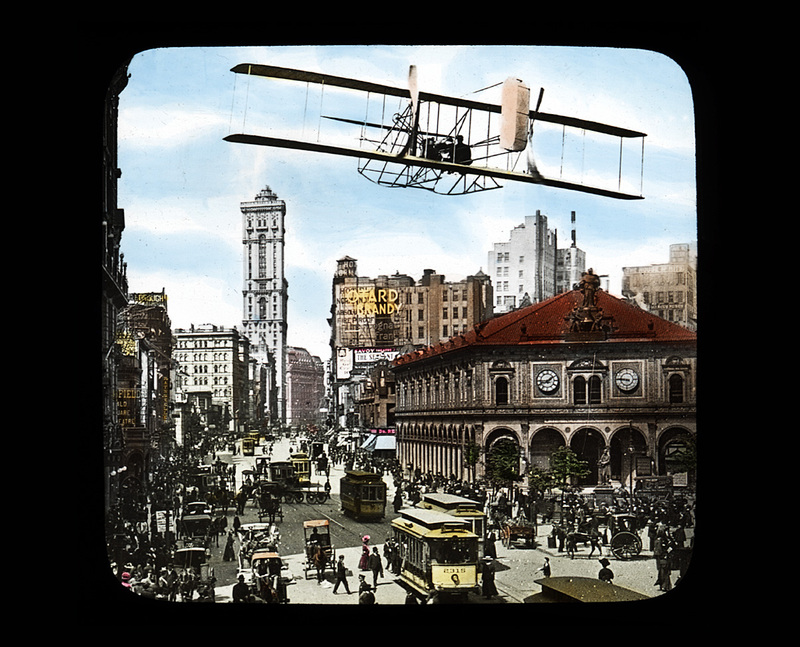 Aeroplane over Herald Square. Courtesy: The Marnan Collection LLC. 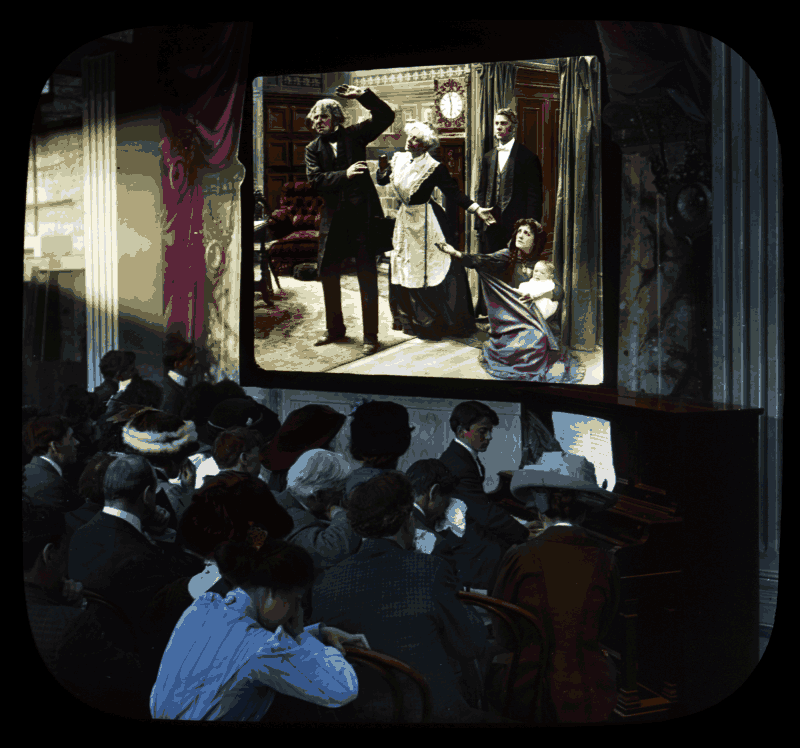 From the start, movies were also occasions for experiments and displays of showmanship. 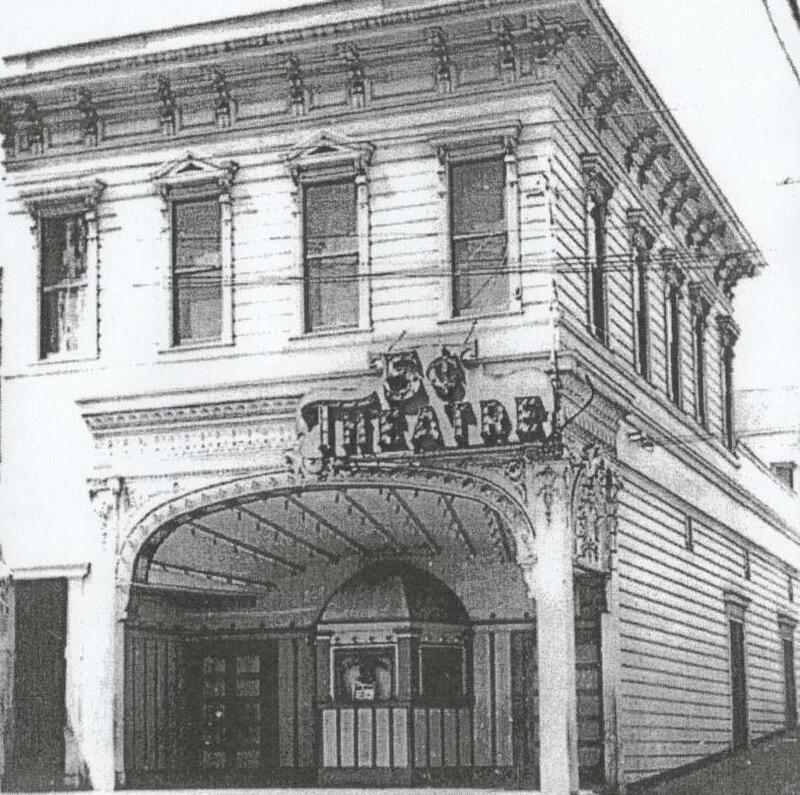 Over at the short-lived Blue Mouse on Polk Street, the manager stood on the balcony with a megaphone, telling the story of each film as it unreeled; while at the Electric on Market Street, the vaudeville performers doubled as screen voices, standing behind the curtain and inventing dialogue. The current production keeps the tradition alive by showing George Méliès’ hand colored The Kingdom of the Fairies with live narration and incidental sound effects by the cast. Live acts were meant to be colorful, entertaining, and—in the Bay Area, at least—unusual. When the Nasser Brothers, the men who later built the famous Castro Theatre, created their Liberty nickelodeon in 1910 on 18th St. and Collingwood, one of their prize attractions was a fellow who ate nails five shows a day. The Jose nickelodeon on Market Street became headquarters for the AIDS Memorial Quilt Project and is now Catch Restaurant. You can still see the original trim today. But the most ubiquitous live acts were the illustrated songs and illustrated lectures. The current program shows what a lecturer could do with a talk that combines shock, patriotic fervor, song, and faked newsreel footage to inspire and stir audiences. The lecture is called “The Assassination of William McKinley and the Execution of Leon Czolgosz,” reconstructed from materials found in the Wisconsin State Historical Society. The presentation started life as a 1910 Ringling Brothers circus act. Actual photographs are mixed with drawings and staged actions to recreate the events. Most remarkable is the faked Edison newsreel of Czolgosz’s execution, directed by Edwin S. Porter. Edison had a vested interest in the electrocution, less interested in Czolgosz than in the electric chair itself. Involved in a bitter rivalry with Westinghouse, Edison wanted to illustrate the lethal dangers of alternating current, the Westinghouse alternative to Edison’s direct current. What better illustration than seeing what alternating current could do to a man wired up on death row? 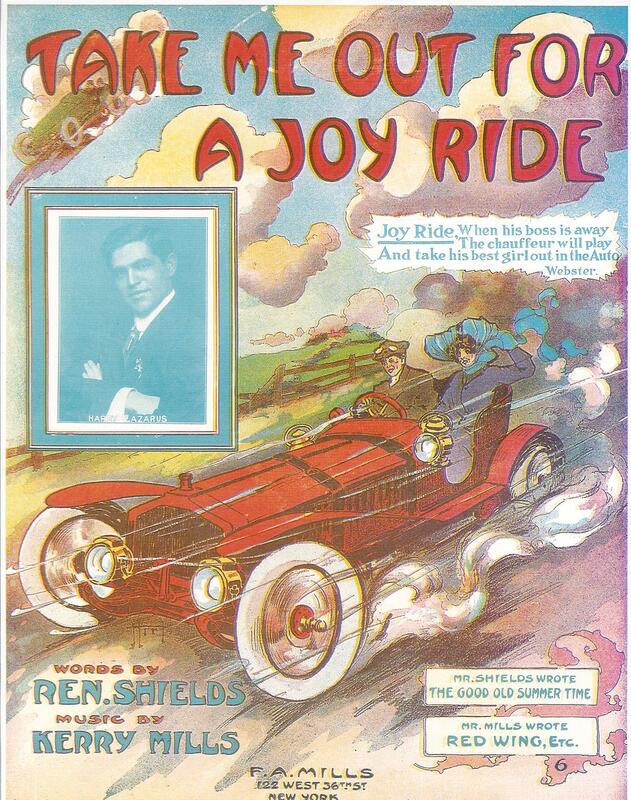 The famous illustrated songs with their deranged hand-colored illustrations are among the hundreds of songs and ballads introduced in the nickelodeon, where audiences were famously invited to “join in the chorus.” The best known nickelodeon songs—like “Bicycle Built for Two,” “In My Merry Oldsmobile,” “Has Anybody Here Seen Kelly?” and “The Oceana Roll”—survived as popular recordings and material for Hollywood movies. And for a while, important Tin Pan Alley songwriters, including Jerome Kern and Irving Berlin, got their start plugging their songs on the nickelodeon stage. 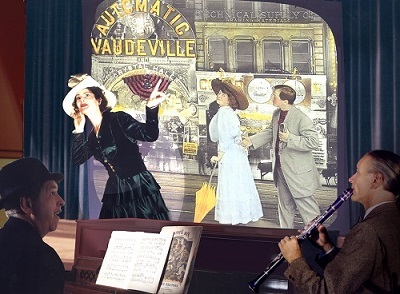 The idea was to get an audience to sing your song in the theater, and then buy the sheet music in the lobby so they could play it at home on their parlor pianos. The result was a lurid and strange form of movie exhibition filled with tensions and excitement where audiences were expected to participate, and come back for a brand new show every three or four days. March 26, 2015, 8 pm. $12. Vogue Theater, 3290 Sacramento (at Presidio Ave), SF. For info go to russmer.wordpress.com. 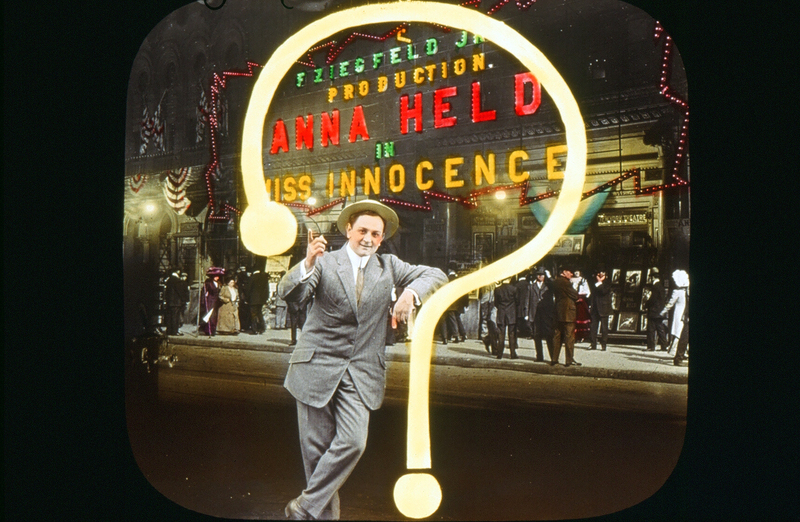 Co-Sponsored by the San Francisco Silent Film Festival and the Pacific Film Archive. 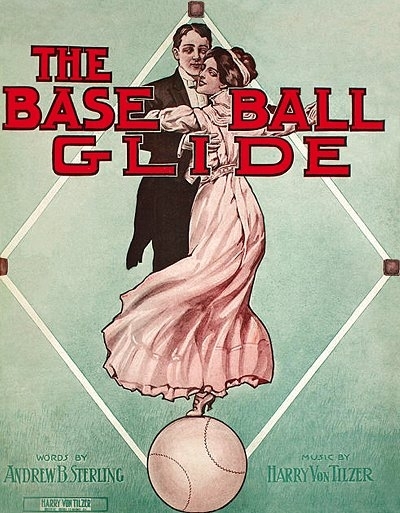 Slides from the illustrated song “At the Ragtime Ball.” Courtesy: The Marnan Collection LLC. Russell Merritt (director/ producer) teaches in the Film Studies Program at UC-Berkeley. He is the co-author (with J.B. Kaufman) of Walt in Wonderland: The Silent Films of Walt Disney (Amazon or Indiebound) and is co-author (with Kevin Brownlow and David Gill) of the Emmy-nominated D.W. Griffith: Father of Film (Amazon or Indiebound). He began recreating nickelodeon shows in the early 1970s while a professor at the University of Wisconsin, and feels he is finally getting the hang of it.